The IDPF today reported ebook sales were up 108% for the month of November, 2008 compared to the same period a year ago. The data is provided in conjunction with surveys conducted by the American Association of Publishers, and represent wholesale sales from only 13 US-based ebook publishers, so total reported sales figures understate actual sales. For the first eleven months of 2008, ebook sales were up about 64%, according to the IDPF. Dig beneath the surface, and the numbers are striking. Ebook sales are surging while the entire trade book industry suffers a decline. Are print sales suffering at the hands of ebook sales? Unlikely. Something else is happening. For the five years between 2002 and 2007 (Click here for data, opens a PDF), overall trade book sales averaged an annual increase of 2.5% (lower than inflation, which means unit sales probably decreased), while ebooks for the same period turned in a 55.7% average annualized increase. 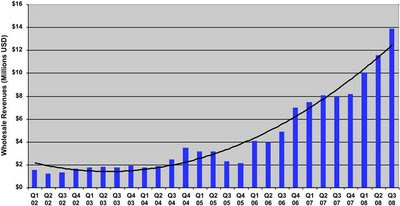 Granted, the robust sales growth for ebooks was off of a tiny base to begin with. But...fast forward to October of 2008, the date for which year-to-date sales are reported on the AAP web site , and you see overall trade book sales for the first 9 months of the year were down 3.4% while ebook sales were up about 58%. So the rate of ebook sales accelerated during the first 9 months of 2008 compared to the previous five years. More interesting, for the month of October the AAP reported overall trade book sales suffered a 20% drop in the year over year monthly comparison, while ebook sales accelerated to 73% growth. Numbers for November and December aren't yet published on the AAP site, though today's numbers from the IDPF, which are supplied by the AAP, indicated that ebook sales have accelerated yet again, up 108% for November. As any numbers guy or gal will tell you, it's easy to show great sales growth when you're growing off of a small base. But when sales show sequential acceleration off of sequentially increasing bases (meaning, you grow faster as you grow larger), then something really interesting is taking place. If we conservatively estimate that overall trade sales for 2008 declined 3%, and ebooks sales increased 70%, then wholesale ebook sales will rise to $114 million and overall trade book sales will decline to $24.21 billion. In other words, ebooks will still only represent 1/2 of 1% of book industry sales, at least here in the US. If you're attending the Tools of Change conference February 9-11, I invite you to attend a panel I'm moderating titled, "The Rise of ebooks," where we'll explore the past, present and future of ebooks and try to understand the implications of these numbers for publishers and authors alike. In the meantime, if you're an author, you need to start exposing your books to the digital realm. Clearly, as the numbers above indicate, you should continue to publish in print because ebook sales will account for only a small percentage of your overall sales. In the years ahead, however, ebooks will become an increasingly important format for book consumption. Ebooks also give authors the opportunity to dramatically increase their available audience in a short period of time. With our Smashwords ebook distribution deal with Lexcyle the other week, for example, the books of Smashwords authors are now available in the native Stanza catalog. Stanza has been downloaded by approximately one million people to read ebooks on the iPhone and iPod Touch. As physical book shelves disappear due to bookseller consolidation, authors and publishers need to expand their distribution to digital shelves. Do you have another source, or am I missing something on the IDPF's stats page? I hope I'm just being an idiot; sales figures like this are good for everyone in my line of work. eBook sales statistics for November have been released from the Association of American Publishers (AAP) who collects these statistics in conjunction with the IDPF. Trade eBook sales were $5,100,000 for November 2008, a 108.3% increase over November 2007. Calendar Year to Date Revenue is up 63.8%. Just a reminder these are wholesale revenues reported from 13 participating Trade Publishers." You're correct, the AAP and IDPF have not published December data yet. Thanks, Mark, very interesting and very good news then.